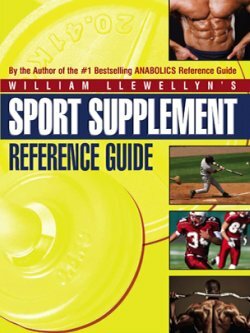 Sport Supplement Reference Guide by William Llewellyn On Sale! Everything you ever wanted to know about performance-enhancing supplements - hype-free! The author of one of the leading books on performance enhancement, the ANABOLICS Reference Guide, and a top researcher in the field of sports nutrition, has done it again! William Llewellyn is rocking the supplement industry with his latest book, the SPORT SUPPLEMENT REFERENCE GUIDE. Using his “no bull” approach, Llewellyn breaks down which performance-enhancing supplements are backed by real science and research, and which ones are pure hype. With the rising costs of supplements it is time to know which ones are effective and which ones have little value. The Sport Supplement Reference Guide includes a comprehensive, in-depth review of the top selling supplement ingredients. There’s a clear, organized rating system as well as a summary of the effectiveness ratings for each ingredient. Whether you want to increase muscle size and strength, enhance sports performance, or improve aerobic endurance, this guide will provide you with practical information so you can identify which supplements are right for you. In addition, the Sport Supplement Reference Guide is filled with valuable information for anyone who feels lost in the frustrating maze of thousands of sports supplements, not knowing which way to turn. This is the first, most detailed, comprehensive, extensively researched and up-to-date guide ever written on the subject. Isn’t it time to get the facts so you can make informed decisions on the right supplements to take? Llewellyn describes the questionable marketing tactics used by many aggressive supplement companies and how to avoid getting duped, or even more serious, potentially develop health-related problems. You will also learn how and when each supplement can be used to its absolute maximum potential, the most effective dosages, as well as critical health information backed by key clinical studies. As a valuable bonus, the Sport Supplement Reference Guide offers easy-to-follow multi-product supplementation programs that can kick anyone’s gains into high gear. You can have the world of performance science right at your fingertips, and the guesswork and frustration associated with too many choices removed. This groundbreaking and controversial book is a must-read before purchasing any performance-enhancing supplements. Why continue to throw money down the drain, when you can have the hard facts right now? William Llewellyn has over fifteen years as a research scientist, writer, and lecturer in the field of human performance enhancement. He has authored nine books, and written countless articles in the field of sports supplementation for some of the industry’s leading magazines, including Muscular Development where he is a longtime contributor and monthly columnist. Llewellyn has also appeared on the cover of ESPN Magazine, on Fox, Discovery Times and ESPN’s “Outside the Lines.” He maintains an active schedule of research and lecturing around the world on the subject of sports supplementation.